After the big hit 'Karayasthan', director Thomson has already kick started the works for his new movie. Titled as 'Kammath & Kammath' this will have hit writer's Udhay Krishna- Sibi K Thomas once again pushing the pen for another Thomson film. 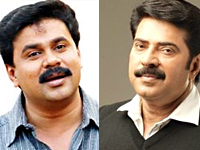 This time the crew is also trying to bring in Janapriyanayakan Dileep in the role of other Kammath, which Mammootty will don that of the first. Meanwhile,the makers are waiting for the final nod from Dileep to move on with the movie. It is now expected that Dileep will find time by January to be a part of this movie with Mammootty. In fact, Dileep had never wasted any chance to be a part of any of the Mammootty starrers that came his way.Produced by Subair, 'Kammath & Kammath' will be on sets as soon as the clash of dates of its lead stars are over.